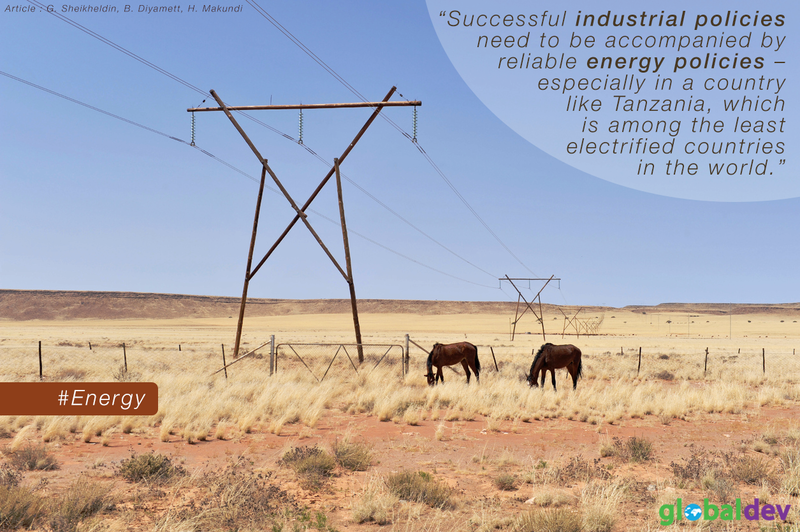 Successful industrial policies need to be accompanied by reliable energy policies – especially in a country like Tanzania, which is among the least electrified countries in the world. This column outlines how combining low-carbon energy solutions with energy-efficient use of carbon-based sources is not simply a good option for Tanzania, but a necessity. The country’s development authorities would reap enormous benefits from a comprehensive policy of energy for industrialization, built through broad consultation with multiple stakeholders. Energy is a key input in the industrialization process of any country. Those that have achieved higher levels of industrialization in recent decades (newly industrialized countries and emerging economies) have seen energy production and consumption growing proportionally with the industrial sector. For example, the industrialized economies of Asia were not highly electrified when they embarked on the path of industrial development. But their energy problems were addressed so that the processes of industrialization were not hindered by bottlenecks of energy supply. The lesson from such experiences is that successful industrial policies need to be accompanied by reliable energy policies. Tanzania would be right to draw that lesson. Tanzanian GDP has been increasing by about 5-7% annually over the past decade, making it one of the fastest growing economies in Africa. But adjusting for population growth over this period, per capita GDP growth has averaged only 2.5-3.5% annually, which is not so impressive. Furthermore, the impact on poverty reduction is insignificant thus far because the sectors of high wealth generation and job creation, such as agriculture and industry, have seen a combined decrease in their contribution to the rising overall GDP. According to an official report in 2015: ‘While the highest potential for shared growth that leads to wealth generation and job creation lies in the agricultural and industrial sectors, the contribution of these sectors to the GDP has declined to the less significant rates of 24% and 10% respectively compared to 46% and 9% during the 1990s.’ The two sectors are highly dependent on each other; while the industrial sector, especially the agro-processing sub-sector, depends on agriculture for raw materials, the agricultural sector cannot advance without the development of the manufacturing sector. Fortunately, the government of Tanzania has realized this interdependency and has put industrialization at the top of the development agenda. Realizing the forward and backward linkages with the agricultural sector, emphasis has been placed on resource-based industrialization, with sub-sectors that have direct linkages with the agricultural sector receiving top priority. According to the country’s integrated industrial development strategy, priority sub-sectors include fertilizer and chemical industries, agro-processing, textile industries, leather and leather goods, light industry and manufacturing, and the iron and steel industry. Tanzania’s national planning is currently aimed at graduating to a middle-income, semi-industrial economy by 2025. As a strategy for achieving that goal, the five-year national development plan 2016/17-2020/21 highlights the use of science, technology and innovation. Despite efforts to improve electrification over the past two years, Tanzania remains among the least electrified countries in the world. For example, in 2016, manufacturing firms experienced an average of nine power outages per month, costing them 15.1% of total sales. The energy access situation report of 2016 shows that of all consumer units in the Tanzanian mainland, 32.8% were electrified with any form of electricity (including households, commercial units, firms, public buildings, etc.). In rural areas, electrification is still low, making it a major challenge to initiate non-farming activities (agro-processing and others), which are key for structural transformation. There are also environmental changes affecting Tanzania’s capacity for energy generation. Hydropower generation is one of the country’s major sources of electricity, particularly during the rainy seasons, yet hydropower is vulnerable to rainfall fluctuations caused by climate change. Combining low-carbon energy solutions with energy-efficient use of carbon-based resources is not simply a good option for Tanzania but a necessity. Having diverse sources and innovative approaches to maximizing generation for industrialization, as well as minimizing losses and negative environmental impacts in the process, remains a key sustainability challenge for Tanzania’s energy sector. Currently, Tanzania is seeking multiple actors to participate in electrifying the country. The 2008 Electricity Act released the state’s main parastatal for electric supply, TANESCO, from the burden of sole control of electricity production and distribution in Tanzania. Some frameworks were also established to engage non-state actors in electrification, such as feed-in tariff schemes, net metering and opportunities for tendering and unsolicited proposals for energy production plants. Yet a comprehensive energy policy, with an emphasis on industrialization, remains to be seen or made operational. But while there has been a recent influx of renewable energy enterprises in East Africa providing small-scale power solutions (mostly to domestic users and sometimes small businesses), the ways in which such businesses operate and their actual overall impact need re-examination and perhaps restructuring. Such trends need to align efforts with Tanzania’s overall industrialization agenda. Tanzania is currently going through a period in which serious attention is being directed towards industrialization. To expect tangible results, a sound energy policy is essential for an effective industrial policy. Policies can make or break successful stories of industrialization as well as electrification. A recent global comparative study of industrial development in Africa and emerging Asia concluded that ‘comparative results from case studies suggest that policy choices are largely responsible for the differences in industrialization outcomes’. Given the high stakes, policy-making, implementation and evaluation need to be informed by evidence (that is, based on empirical knowledge and carefully studied conclusions through research). The Tanzanian development authorities would reap enormous benefits from a comprehensive policy of energy for industrialization, built through broad consultation with multiple stakeholders, particularly researchers, non-state energy producers and potential investors. Gussai Sheikheldin (PhD) is a research fellow with STIPRO, as well as an author on development and technological change in English and Arabic (e.g. Liberation and Technology, 2018, Dar es Salaam; and As’Sulta Al’Khamisa (the fifth Estate), 2015, Cairo). Bitrina Diyamett (PhD) is the executive director of STIPRO. She is also the first and current president of AfricaLics, a continental network that brings together scholars, researchers and policy analysts who study development, innovation, learning and competence building systems in an African context. Hezron Makundi (PhD) is a Faculty member at the Institute of Development Studies, University of Dar es Salaam, and a Fellow with STIPRO. He researches development cooperation, and the developmental aspects of science, technology and innovation.